Go for a jaunt from Dallas to Fort Worth to see Fort Worth Stockyards National Historic District about 48 minutes away. There's much more to do: see the interesting displays at The Sixth Floor Museum at Dealey Plaza, admire nature's wide array of creatures at Dallas World Aquarium, pause for some photo ops at John F. Kennedy Memorial Plaza, and explore and take pictures at AT&T Stadium. To see ratings, maps, where to stay, and more tourist information, read our Dallas trip planner . Sydney, Australia to Dallas is an approximately 19.5-hour combination of flight and tram. You can also fly; or do a combination of flight and car. Traveling from Sydney to Dallas, you'll gain 16 hours due to the time zone difference. April in Dallas sees daily highs of 29°C and lows of 16°C at night. Wrap up your sightseeing on the 24th (Wed) to allow time to travel to San Antonio. Pack the 27th (Sat) with family-friendly diversions at SeaWorld San Antonio. There's still lots to do: steep yourself in history at The Alamo, tour the pleasant surroundings at The San Antonio River Walk, take in nature's colorful creations at San Antonio Botanical Garden, and trek along San Antonio Missions National Historical Park. To see more things to do, other places to visit, ratings, and other tourist information, read San Antonio trip itinerary planning site . Fly from Dallas to San Antonio in 3.5 hours. Alternatively, you can drive; or take a bus. In April, daily temperatures in San Antonio can reach 32°C, while at night they dip to 18°C. Wrap up your sightseeing on the 29th (Mon) to allow time to drive to Fredericksburg. When in Fredericksburg, make a side trip to see Old Blanco County Courthouse in Blanco, approximately 46 minutes away. Next up on the itinerary: brush up on your military savvy at National Museum of the Pacific War, experience rural life at Wildseed Farms, awaken your taste buds at some of the top wineries in the area, and pause for some serene contemplation at St. Mary's Catholic Church. To see more things to do, maps, where to stay, and more tourist information, you can read our Fredericksburg day trip planner. You can drive from San Antonio to Fredericksburg in 1.5 hours. Another option is to do a combination of bus and taxi. Prepare for slightly colder weather when traveling from San Antonio in April: high temperatures in Fredericksburg hover around 28°C and lows are around 13°C. Finish up your sightseeing early on the 2nd (Thu) so you can go by car to Austin. Austin is known for museums, nightlife, fun & games, nature, and parks. 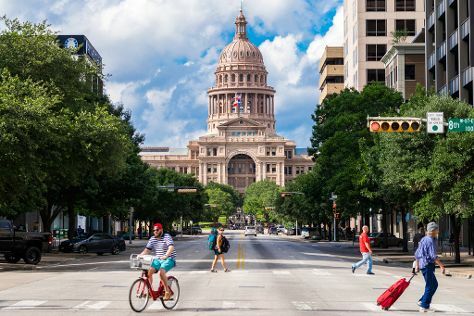 Your plan includes some of its best attractions: get a sense of history and politics at Texas State Capitol, look for all kinds of wild species at Lady Bird Johnson Wildflower Center, get engrossed in the history at Bullock Texas State History Museum, and take in the views from Congress Avenue Bridge / Austin Bats. To find reviews, traveler tips, ratings, and more tourist information, read Austin trip planner . You can drive from Fredericksburg to Austin in 2 hours. Alternatively, you can take a bus; or do a combination of bus and train. In May, daily temperatures in Austin can reach 34°C, while at night they dip to 21°C. Finish your sightseeing early on the 7th (Tue) so you can drive to Houston. Houston is known for museums, nightlife, childrens museums, zoos & aquariums, and fun & games. Your plan includes some of its best attractions: examine the collection at Space Center Houston, take in nature's colorful creations at Hermann Park's Japanese Garden, explore and take pictures at Minute Maid Park, and tour the pleasant surroundings at Hermann Park. To see ratings, photos, maps, and tourist information, read our Houston online driving holiday planner . Traveling by car from Austin to Houston takes 3 hours. Alternatively, you can take a bus; or fly. In May, plan for daily highs up to 34°C, and evening lows to 23°C. On the 11th (Sat), you'll have the morning to explore before heading back home.